With Viv taking day to day responsibility for the running of the school, in addition to instructing on courses Paul ensures that our boats, classrooms and kit are up to scratch. Paul’s passionate about powerboating and sailing and spends as much time afloat as possible. He also writes for a variety of magazines and has written the RYA Powerboat Handbook and the RYA Advanced Powerboat handbook for the RYA. The Powerboat Handbook is available in German, Portuguese, Arabic and Italian. He was also invited to write a few chapters for Heavy Weather Powerboating by Hugo Montgomery-Swan which was published in 2010. 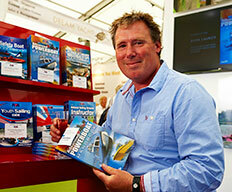 In 2011 he was invited by the RYA to write the RYA Advanced Powerboat Handbook. This has been written and the images are being prepared by Pete Galvin who did them for the Powerboat Handbook. It was launched in September 2014 at the Southampton Boat Show. 2016 saw the launch of the third edition of the RYA Powerboat Handbook. Paul also undertakes most of the Instructor Courses at the school and visits various other centres in the UK, Europe and Middle East to run Instructor courses for them too. He was actively involved in the growth of the RYA Personal Watercraft courses for Superyachts visiting a number of the yachts and running Instructor courses both in the Med and the UK. He has been to the Middle East to run courses there and assisted in the development of the commercial powerboat scheme in Bahrain following a tragedy that led to the suspension of commercial boating activity there. Paul has led a PTUK team spending 6 – 8 weeks a year training a Coastguard unit in a range of areas such as boat handing, helicopter transfers, search and rescue techniques, boat to boat moving transfers and maritime interdiction. Paul had great fun with Hannah, Sammy & Viv as part of the Round Britain and Ireland RIB Rally doing about 1700 miles in 12 days circumnavigating the UK including Scotland. Read more here. In 2013 with Top Hat acting as a safety boat he completed the Round Ireland Challenge to complete his circumnavigation of the entire coast of the UK & Ireland. Read more here. Paul is also approached to act as an Expert Witness in cases involving motor cruisers, powerboats and personal watercraft. “Always the sceptic I had a pre-conceived idea this would be another theory course. In fact it was an excellent mix of practical tasks combined with lots of useful hints and tips……… absolutely spot on, so much so that I want to do the Advanced Course – even at my advanced years!” John commenting on the Intermediate Powerboat Course that he undertook on his own 24ft Sports Fisher with his wife.